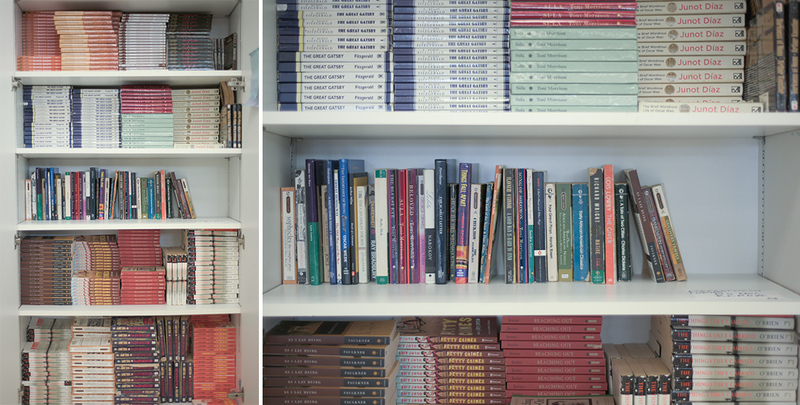 On a shelf within the Language Arts Department’s warehoused novels, On the same page is a lending library of fiction literature that is NOT being taught this school year. Before and after school, between classes, at lunch, and during my planning period, readers (students) can check out books from the Secret Stash. Readers who make notes/notations in Secret Stash texts can add a corresponding unique mark and their initials to the Key on the inside or back cover of the book so that future readers can know where and perhaps what some previous reader thought about passages in the text. Selections in the Secret Stash go in and out of ‘official’ circulation based on Department instructors’ syllabi. On the same page exists within the purview of the institution; all Secret Stash texts are school/board-approved and purchased. I keep track of who checks out and returns a book. But, wherever current readers communicate with future readers through notes/notations, a ‘radical opening’ exists.